In January I released a very simple tool called ‘WinWOL’ (Windows Wake on LAN) which, as the name suggests is a Windows based Wake on LAN manager. Over the last few months I have been looking at the software again and wanted to change how it worked to make it a little simpler to use. This resulted in a complete re-design of the user interface to adopt a ‘Tab based look and feel’ and a recompilation of the code against .NET 4.0 to allow for more people to be able to run the tool without necessarily having to update .NET on their machines. Today I am pleased to announce the release of WinWOL version 1.1. 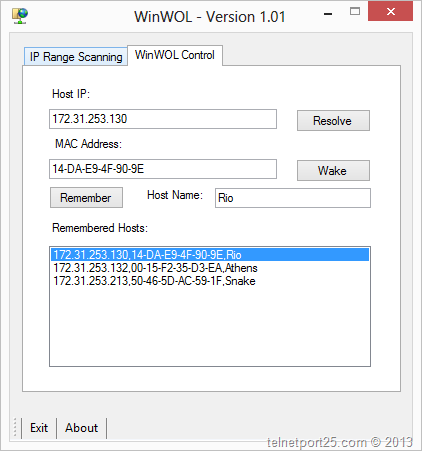 One you have performed a IP Range Scan, selecting the host will automatically populate the details Win the WinWOL control section. 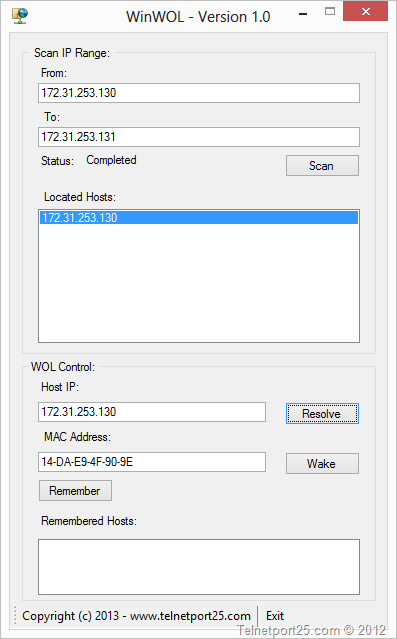 Selecting a host from the “Remembered Host” section will populate various information in the WinWOL control section, double clicking on a remembered host will automatically send the ‘Wake’ packet. You can download the WinWOL installation and user guide from the following location.